I was ecstatic to serve as a professional judge during Battle Eggs at Fire in the Triangle, an iron-chef like cooking competition. Chef Matthew Hannon from Ashten’s in Southern Pines battled Chef Scott James from Midtown Grille in Raleigh. Chefs were required to use eggs as the secret North Carolina ingredient, ranging from duck, quail and chicken eggs. The judges determine 30 percent of the winner so the pressure was on! I love food, but I needed to judge the dishes with a critical eye and pallet. I couldn&apos;t talk about how much I enjoyed a particular dish with the diners at my table, which was also difficult. I was revealed as a professional judge at the end of the competition and enjoyed representing the visitRaleigh blog. 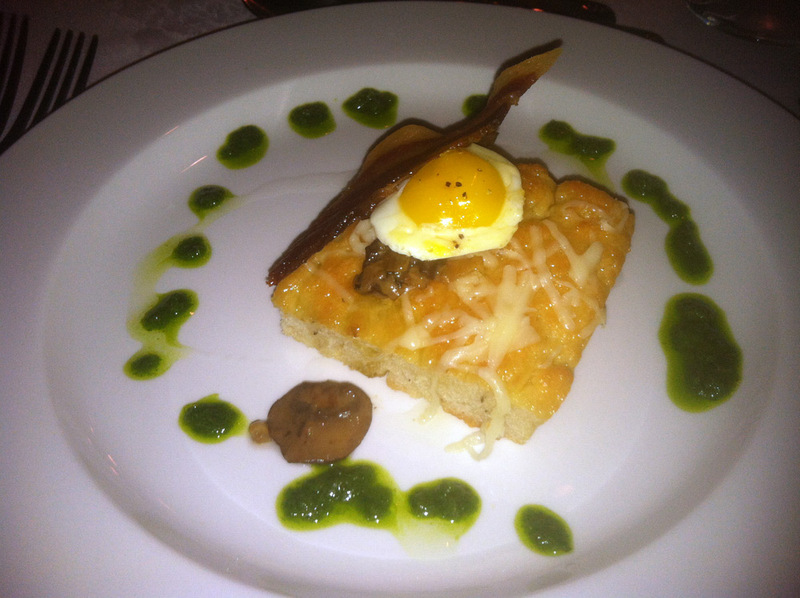 The first course, truffled quail egg with tarragon, mangalitsa bacon and mushroom tart was prepared by Chef Hannon. I thought Chef Hannon did an excellent job featuring the secret ingredient, plus you can’t go wrong with truffle oil and quail eggs. The dish was nicely plated and smelled wonderful. Dish two was by far my favorite of the night; smoked duck sausage, asparagus, crawfish, duck egg hollandaise and crispy potatoes. 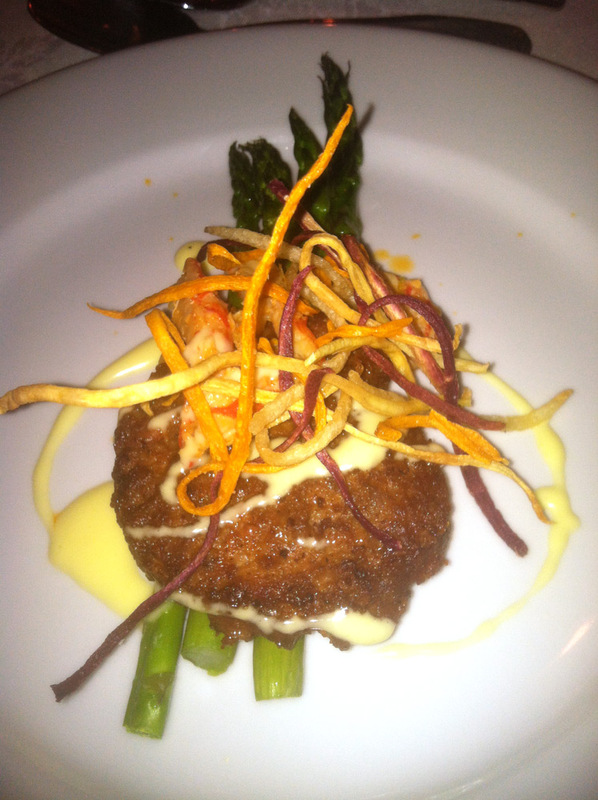 Chef James definitely showed his creativity with this dish. The duck egg hollandaise was rich and I also appreciated the chef using one of North Carolina’s finest ingredients in his masterpiece, the sweet potato. The young boy sitting next to me, Noah, ate the whole dish and even wanted seconds! Rosemary smoked chicken breast with cornbread tasso pudding, crispy collards and deconstructed choron sauce was the third course, prepared by Chef Hannon. 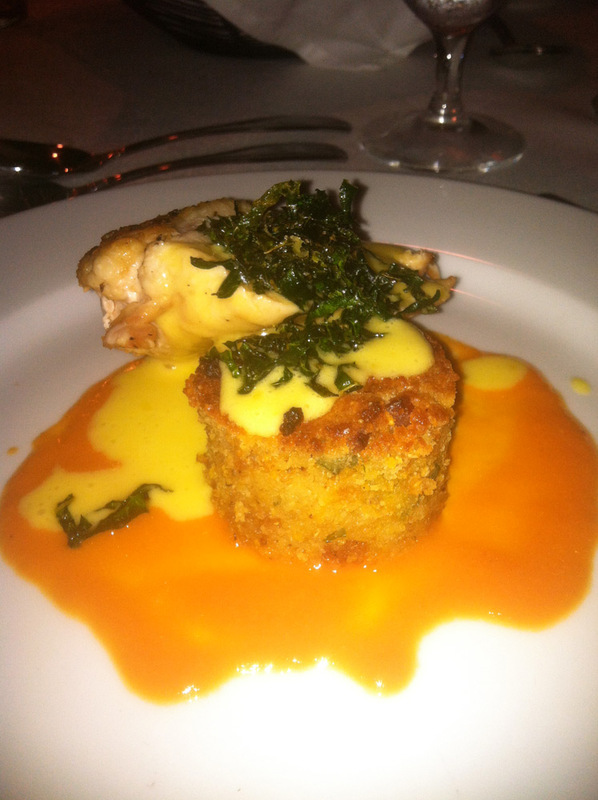 I thought the chicken was delicious and tender, and paired well with the cornbread pudding. 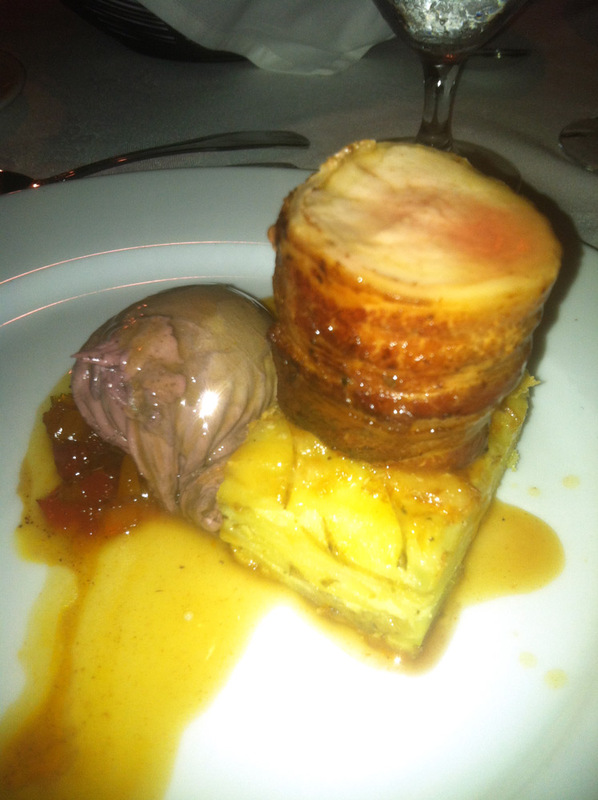 Dish four was “bacon and eggs”: bacon wrapped pork tenderloin, pommes dauphinoise, red wine poached egg and chow chow. I’m not sure how Chef James and his crew poached 120 eggs! The pork tenderloin with even more pork wrapped around it was delicious. The poached egg was unique and I enjoyed the eggs and pork together. Finally, it was time for dessert! The first dessert was prepared by Chef Hannon: peach cheesecake on an orange grit cookie with brandied apple caramel, pecan praline ice cream and Hawaiian sea salt Florentine. Can you get more Southern than this dessert? 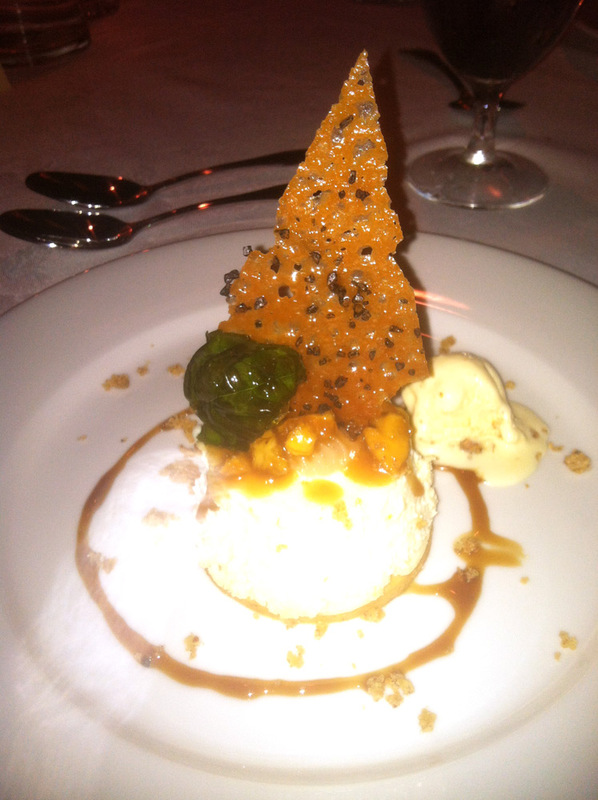 The dessert was beautifully plated and I especially loved the crunchy, orange grit cookie. The cheesecake was light and had a subtle, delicious peach flavor. 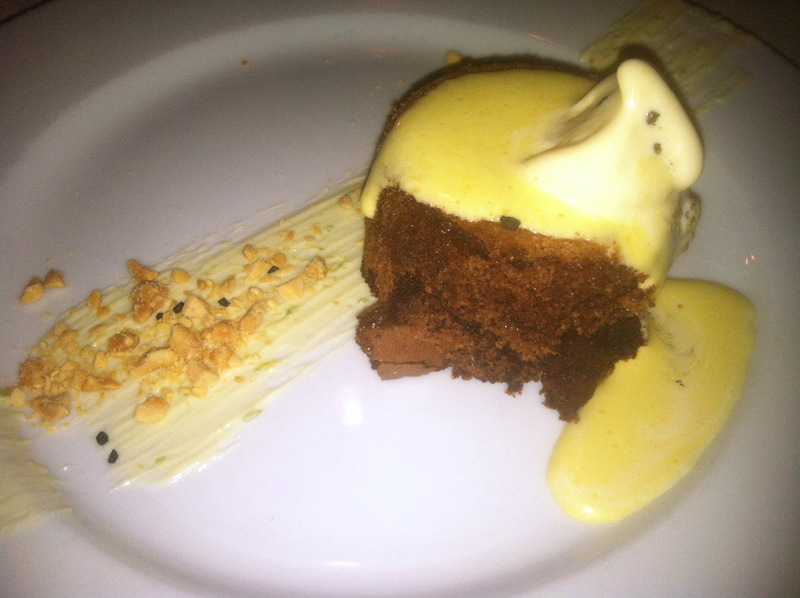 The second dessert, prepared by Chef James was a dark chocolate torta with tamarind gelato, ginger sabayon, white chocolate and lime. The torta was rich and definitely made this chocolate-lover happy. The refreshing taste of ginger was a nice way to end a decadent six course meal. I thought both chefs did a phenomenal job. Until last night a Raleigh area restaurant had not won one of the Fire in the Triangle battles yet, so it was nice to have Midtown Grille come out on top. The Midtown Grille team was ecstatic and exhausted. During the competition, one of the members sliced his hand with a knife while cutting butter and had to go to urgent care! Six stitches later he came back to the competition. Now that’s dedication. I went to Midtown Grille to celebrate the victory with Chef Scott James and his crew. The quaint restaurant is located in North Hills and is absolutely beautiful with white table cloths, flowers, and glass chandeliers. Perfect for a date night! You should definitely pay Midtown Grille a visit when you’re in Raleigh to taste some of the Chef Scott James’ creative food, which features locally grown North Carolina products.